Out of Chaos by Elle Mott is now available in print and digital editions from retailers worldwide. 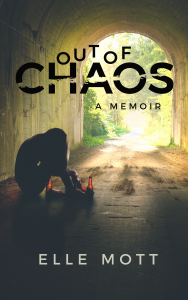 Out of Chaos is a harrowing true story of choices and consequences. As a teenager, Elle Mott descended into hopelessness. Her life as a criminal and a vagrant led her deeper into the darkness. Balancing multiple identities, the more secrets she kept, the more lies she needed. She sheds personas, rebelling against who she was and who she’s becoming, but thousands of hitchhiked miles can’t distance her from the crushing expectations of her great-grandmother’s legacy. Elle Mott is an established writer, living in Northern Kentucky. You can learn more about her on her website, www.ElleMottAuthor.com.